So it would seem that you've read my first post on this subject and are back for more! Excellent! I've given you some of the relevant research, though there isn't much. Now let's tackle ankle anatomy, joint biomechanics during landings, and how taping/bracing changes those mechanics. If at that point you can appreciate the potential for injury - I'll consider this a success! If not - let me know so I can better explain and prove it! The tibia and fibula are the two bones of the lower leg. 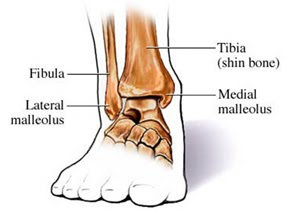 The fibula terminates and is palpable (able to be felt) as the "lateral malleolus" at the outside of the ankle. The tibia is thicker, but it has a bony prominence on the medial side (inside of the ankle) known as the medial malleolus. Often times, many people refer to the connection of the tibia, fibula, and the talus is the "true" ankle joint. That's a good way of simplifying the mechanics, but for the purpose of this post, it falls short. When considering the ankle relative to gymnastics and acrobatics, you need to understand that the ankle joint is composed of three separate articulations. This is due to the complex motion required of the ankle with the sport (rarely is the motion just one dimensional). It allows for variations in foot position without loss of an upright position. It also serves to absorb more forces than just one joint could. The distal tibiofibular joint: The first joint, the distal tibiofibular joint is the articulation between the tibia and the fibula just above the ankle. Though not a true synovial joint, (not encased or filled with fluid) this joint is what gives stability to the ankle mortise (the bottom of these two bones form the "dome" for the talus (part of the next joint). The distal tibiofibular joint consists of the articulation of the medial side of the fibula and the lateral side of the tibia. It is supported by the interosseus membrane of the lower leg, and two small ligaments. It allows only a very small amount of movement with plantar flexion/dorsiflexion of the ankle. This is the joint that is most affected during a "high ankle" sprain. When you tape the ankle, there is minimal effect on this joint as it is not very mobile to begin with. The talocrural joint: This is composed of the dome formed by the ends of the tibia and fibula and the the talus. This joint is encased by a joint capsule and is a true synovial joint. This joint allows primarily plantarflexion and dorsiflexion (pointing the ankle down and flexing it up respectively). When you tape the ankle, the motion at this joint is in fact limited - though that is not the primary goal of the tape. There are six major ligaments in the ankle. Five are along the lateral (or outside) of the ankle and one grouped ligament is on the medial (or inside) aspect. The posterior inferior tibiofemoral ligament and the anterior inferior tibiofemoral ligament stabilize the distal tibiofemoral joint. These are important in gymnastics as they can be weakened by landing "short" on a backward tumbling element repeatedly. When this happens, the talus is jammed up into the space between the tibia and fibula and over time this mortise becomes more flexible. With this, the talus can move beyond the normal range. This leads to an unstable talocrural joint and can cause the talus to "sublux" or get stuck out of place. In this case, the athlete will complain of anterior ankle pain with flexing the ankle/foot or when squatting and may have a noticeable loss of dorsiflexion. It also predisposes a gymnast/acrobat to ankle sprains and can lead to an earlier onset of arthritis in the joint! The other three lateral ligaments are the ligaments most often injured in ankle sprains. These support against excess motion at the subtalar joint, though they cross the talocrural joint as well. They include: the anterior talofibular ligament (ATFL), the calcaneal fibular ligament, (CFL), and the posterior talofibular ligament (PTFL). All three originate from points on the lateral malleolus and terminate on either the talus or the calcaneus. Medial ankle ligaments - "The Deltoid Ligament"
For purposes of this breakdown, isolating out the motions at each of the joints of the ankle mentioned above would be unnecessarily complex. Rather it is important that you can appreciate that the ankle joint is designed to move in multiple ways and multiple planes with all our activities. When you constrain any one direction at one joint - you can appreciate how this could change the motion requirements at the other joints. When a gymnast lands, the foot flattens (slightly), the ankle complex everts slightly (tilts in) and then dorsiflexes (tibia forward over foot). The knee bends (flexes) and the hip bends (flexes). The pelvis and low back tilt forward slightly while the thoracic spine, neck and shoulders should remain fairly rigid. Uploaded by Angela Prescott on 2017-08-23. These motions occur "up the chain" meaning that the order that I described them in is the order that they happen. (Think from the ground --> up). It is a learned pattern of motion - one that we build over time as we train. This pattern is dependent on the angles of motion in the joints below. The goal of the pattern is to decrease forces that are traveling up from the ground during the landing. This means that the low back and pelvis are reacting to the motions at the hips. The hips are reacting to the motions at the knees. And the knees are reacting to the motions at the ankle/foot. It's a team effort to absorb the landing and keep the body upright - and it is my argument that when you change the amount of motion at one joint, the forces and motion requirements at the remaining joints also change. Now, imagine that you have taped both of the ankles. The goal of the tape is to limit the eversion/inversion at the ankle (to protect against an ankle sprain/fracture). If we modify the above description of "normal" motion, we have to completely eliminate the motion at the foot/ankle into rotation. However, it is important to note that there will ALSO be a loss of dorsiflexion due to the tightness of the tape/brace. Now, this loss of ankle motion means that no impact is dampened at that level - so the forces that reach the knees, hips and low back are higher. In an ideal world, and assuming that the landing is square (even) and the muscles/joints are healthy, this would means that the following changes (relative to the above description) would occur: The knees will flex more, the hips will flex more, and the pelvis and low back may have to tip forward more. This would mean that the force reaching the center of the body was the same as that before the ankles were taped. If any of the athletes that I had ever coached actually did that I would congratulate them on that perfect adaptation/compensation. However, none of them ever have because it's not possible - if you tried, you'd fall backward. Decrease motion at the knees and hips and "squat" less (more upright landing). Tip onto the balls of the feet (heels off the ground) to keep the weight forward so as toallow greater knee and hip flexion for force absorbtion. The ankles flexed X-degrees, so the knees will bend Y-degrees, the hips will flex Z-degrees and the pelvis/low back will bend forward W-degrees. This "mental formula" allows the body to absorb the forces and keep the center of mass within the base of support (aka: not fall over). What this means is that when the amount of flexion at the ankle DECREASES, the body doesn't initially respond by increasing the bend anywhere else. It also DECREASES it. It does this based on the motor program has been learned over time. When the ankle bends less, the body hits autopilot for the remaining joints and tells them to bend less such that the center of mass stays within the base of support. (This "smaller" squat is similar to what you might see out of landing from a shorter height.) In the video below, you'll see that the hips don't drop below the height of the block (like they did in the above video). In the first photo, the shins are more upright - indicating less ankle dorsiflexion due to the brace blocking the motion. In turn, the knees are bent less and the back and hips are more vertical. You can see that the waist remains higher (relative to the ground) in the first photo as compared with the second. Also, the quadriceps are very prominent in the first photo (as they are working harder to resist the squat) while in the second photo the force is better distributed on the gastroc (calf) and the quadriceps. In the second scenario (tipping onto the balls of the feet and letting the heels rise), the body is compensating for the change using feedback. This usually happens after several repetitions of a landing with the ankles taped/braced. The body recognizes these "hard" landings and connects them with the now limited motion in the ankles. To compensate, the gymnast changes the motor pattern and now rocks forward onto the toes during the landing - transferring some of the force FORWARD. This allows the knees, hips and back to bend more while keeping the center of mass within the base of support. At face value, these alterations actually look more like "balance checks" or "form breaks" and are likely implemented to keep the athlete upright. Think of them as a "last ditch effort" to save the landing and soften the impact. While this forward weight shift (and lift of the heels) may decrease ground forces on the above joints, it increases the stress on the quadriceps and the patellar tendons. Since the knees are now in front of the toes, the shear on both structures increases. (This is hypothesized as the reason why gymnasts/acrobats in ankle braces develop chronic anterior knee pain.) It also represents a variation that alters the motion and is not as consistent a way to land. When the weight rocks forward onto the balls of the feet, there is less surface area in contact with the ground. Add in a soft landing mat, or a short landing and the gymnast has less ability to correct when the heel is raised. They haven't studied acrobats and gymnasts. They have only assessed movement in a controlled and reproducible environment (treadmill) - not in the variable environment of real athletics. They are not isolating forces at a joint but are inferring them based on athlete reporting and joint angles during comparably low-impact activities (running, lateral shuffle, single-leg squatting). If gymnastic/circus coaches and physical therapists with a history of treating these patients were to publish case studies on these athletes, current evidence might tell a very different story. And finally, before we wrap up, consider what then happens with the addition of an asymmetry - say one ankle braced/taped, the compensatory strategies described above get even more complicated! Now there is more than just a vertical and frontal component to the variation - there is a lateral (side-to-side) variation as well. In these cases, often the athlete will instinctively land on the "good side" more heavily and rely on it to absorb and balance the landing. As such, there is a higher probability of mechanical breakdown and failure. Often gymnasts will "blow out a knee," strain a hamstring or develop chronic back pain on the side opposite their ankle problem. Check back for Part 3 where I'll outline better types of braces, how long they should be used, what you can do to protect your knees and hips while in them, and ways to ditch the tape/bracing faster! landing is associated with increased frontal plane knee motion and moments. Clin Biomech 2010;25(2):142-146. Saeki K, Arisawa H, Kasahara M, et al. Effect of taping ankle on functional performance. J Phys Ther Sci 1995;7(1):27-32. Wikstrom EA, Arrigenna MA, Tillman MD, Borsa PA. Dynamic postural stability in subjects with braced, functionally unstable ankles. J Athl Train 2006;41(3):245-250.